OMG, these are super cute!! Agree totally with u Lia!! We are important in shaping our children's character somehow!! Gambate in ur parenting skills!! It's good for kids to read, but you're right to limit it during the school week. My boy can spend hours reading too, and he also likes the Wimpy Kid series. So cute and great ideas! Again, such perfect bentos! I love how artistic and creative you are Lia. I can't believe your kids are back to school already. We have barely started our summer here. lol. Great bento with the two kids reading. My eldest son love to read too, and I hope that he will bring good impact to my youngest too, just like yours...hehe. yup..i totally agree good reading habit has to be from young.. I started with bedtime story to my boy.. hopefully little miss E will love reading too..
your bento looks so delicate in that tiny box. Your Bento post is so intresting & creative. Like to follow you post. 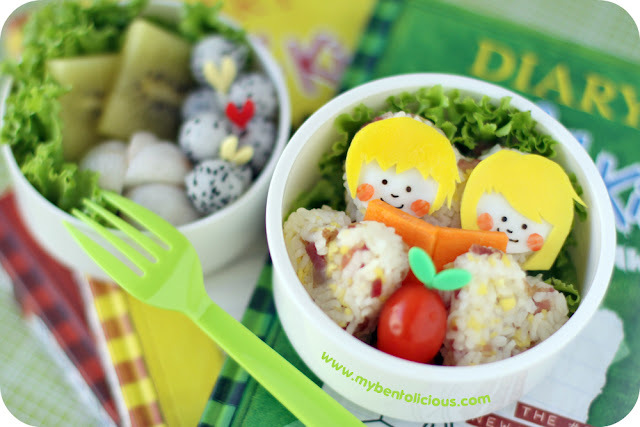 That bento is so delicate and cute. Just lovely. hihi you're back !!! This bento is so cuuuuute !! @Quay Po Cooks : Thanks a lot! @AikoVenus : Thanks a lot! Amazing, reading-topical and perfectly delicate sweetness. Your bentos are like no one else's Lia!